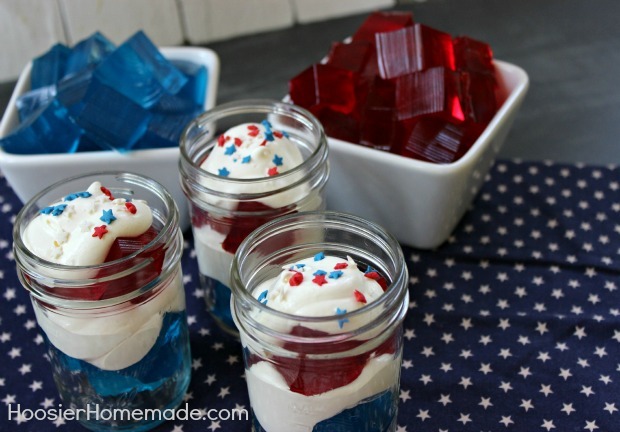 Using a simple ingredient like Jell-O and turning it into an impressive looking dessert is easy with these 4th of July Jell-O Parfaits. 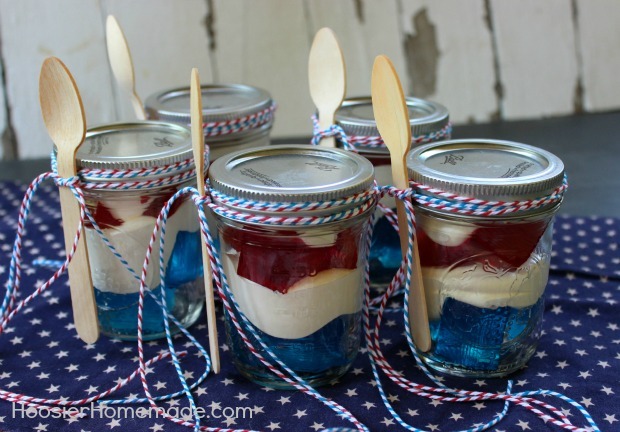 You can layer them into mason jars, seal them up and have a fun treat to take along to your 4th of July Parties, Cookouts and Potlucks. 4th of July is one of my favorite holidays! Our town hosts a huge parade and fireworks, with several events leading up to the big day. Potlucks and picnics also play a big part in the holiday fun, and of course the delicious Picnic Food is always top on everyone’s list. 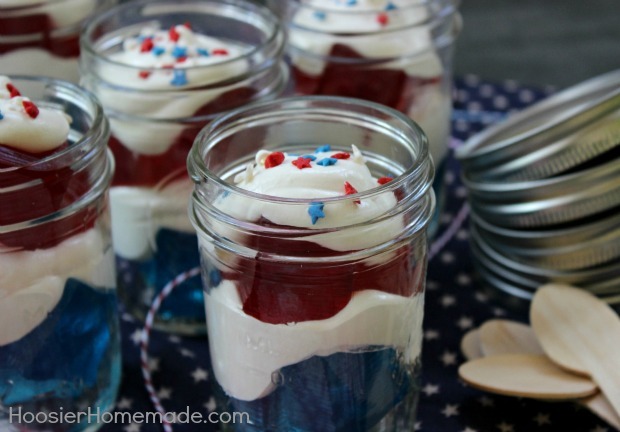 One of the reasons I love this holiday so much are all the 4th of July Desserts and Recipes; from fun Fourth of July Cupcakes, to No Bake Dessert, to Dessert to take to a Potluck, and everything in between. 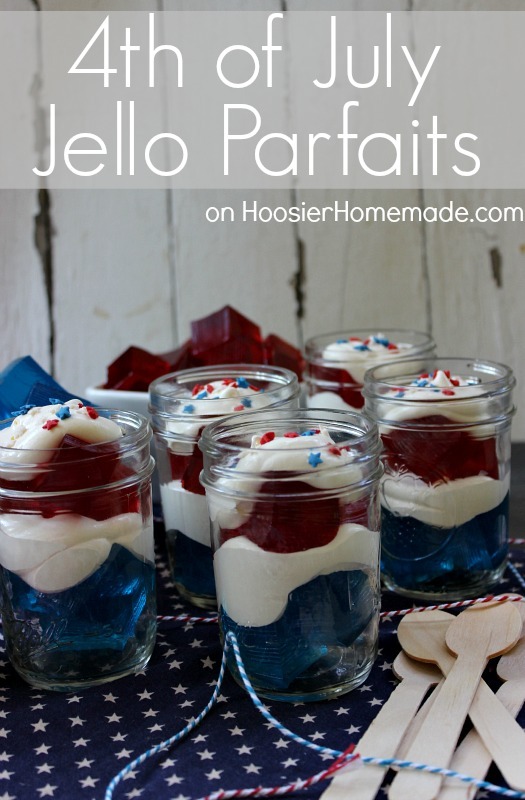 And these Jello Parfaits are super easy, just by taking an ordinary recipe for finger JELL-O, making it with Cherry and Berry Blue JELL-O, adding COOL WHIP whipped topping and layering it in small pint jars, adds a special festive touch to this dessert. There isn’t a man, women or child that I know that doesn’t love JELL-O, especially when it’s served in a fun way. The recipe for finger JELL-O is one that I have served for many, many years to my children. Their classmates would love when I brought in some for the class parties. There are lots of different flavors of JELL-O for you to enjoy for any holiday. You can serve them straight from the jar, or add the lid and pack them in the cooler for your Potluck or Picnic. 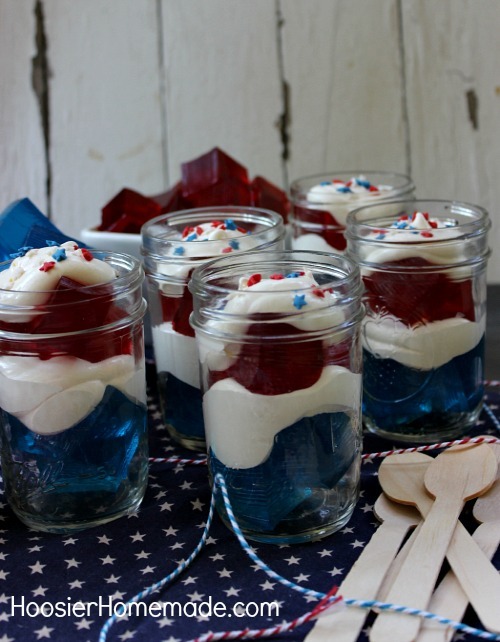 Either way, these 4th of July JELL-O Parfaits are sure to be a hit with your family and friends. Recipe makes enough for 10 jars with about 1/2 a pan of JELL-O left over, if you need to fill more jars, just increase the amount of COOL WHIP whipped topping. You are so right about JELL-O! Who doesn’t love JELL-O? I also love your presentation with the bakers twine and the wooden spoons. They are so much better than using plastic spoons ECO-wise and they are so much cuter. When folks are finished enjoying the JELL-O goodness they can add the spoons to the fire pit if one is available or the compost bin. The more I think about it the more I am falling in love with these wooden spoons. lol Where did you find the wooden spoons? Tell me! Tell me! Tell Me! Pleeeaaassseee!!! I’ve always been awful at making jello into cute little cubes. I’ll have to try your way! I love these little desserts! Thanks for stopping by Angie! We love jello made this way, let me know if you get a chance to try it. Pinned to my Holiday Recipe Board! Oh Liz these are so cute! Pinning! Thanks so much Katrina! I love serving dessert in a jar, it’s fun to make and fun to eat!